Be the first to share your favorite memory, photo or story of Burke. This memorial page is dedicated for family, friends and future generations to celebrate the life of their loved one. 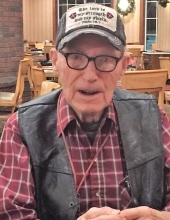 A funeral service for Burke B. Hazelrigg, age 99, of Jacksonville, is scheduled at 3 o’clock in the afternoon Friday, April 19, 2019 at Autry Funeral Home Chapel in Jacksonville. Bro. David Hallum will officiate. Mr. Hazelrigg will be laid to rest at Still Waters Memorial Gardens in Jacksonville. Burke passed away, suddenly after a very short illness on Saturday, April 13, 2019 in Tyler, surrounded by his son, grandchildren and close friends. He was born December 8, 1919 in Grand Rapids, Minnesota to Glenn and Gladys (Taylor) Hazelrigg. Mr. Hazelrigg was a retired teacher and Consumers Power employee. He was best known for his life-long hobby as a puzzle maker, his puzzles often containing Biblical quotes. Burke was a member of the Afton Grove Baptist Church. He was preceded in death by his parents; first wife, Genevieve Hazelrigg; his second wife; Nora Hazelrigg; a daughter, Aurora Hough; and a son, Brian Hazelrigg. Left to cherish his memory are his son, Meredith Hazelrigg and wife Junko, of Tokyo,Japan; daughter-in-law Lavonne Hazelrigg of Allegan, MI; son-in-law, Gene Hough and wife Pat, of Allegan, MI; five grandchildren, Blair (Charity) Hough, Blaque (Cari) Hough, Denise Hazelrigg, Seth Hough, and Ken Hazelrigg; 13 great-grandchildren; and numerous nieces and nephews. He will be missed by his dear friends: Mary Jane Barr, Charlie Walker and wife Carolyn, all of Jacksonville, and Keith Wright and wife Carolyn of Tyler. "Email Address" would like to share the life celebration of Burke Hazelrigg. Click on the "link" to go to share a favorite memory or leave a condolence message for the family.